Creates a decorative border around your lawn, garden or flowerbeds. Weather resistant white vinyl. 12"H x 23"W EACH PIECE. 6 PIECES PER BOX. (3 BOX PER ORDER). Manufacturer Part Number. They are Standard. U channel in picture NOT included. Creates a decorative border around your lawn, garden or flowerbeds. Weather resistant white vinyl. 12"H x 23"W EACH PIECE. 60 PIECES PER BOX. Manufacturer Part Number. Many options exist, we also have the ability to custom fabricate fencing as we are the manufacturer. These sections are built with no brackets or glue. No tools are needed to assemble. Louisville (Victorian) Style Scallop Top Spaced Picket. 40 Linear Feet of 4' H x 8' W PVC Vinyl Fencing. Long-lasting and maintenance-free fencing. Since 1951. Create Instant landscaping in your yd or garden with this easy to install No-Dig garden picket fence. To install, you simply insert the stakes deep into the ground (included). this fence kit contains 2 sections for a total of 116in of fence & is perfect to define boundaries in your yd or garden or contain small children & pets. Louisville (Victorian) Style Straight Top Spaced Picket. 40 Linear Feet of 4' H x 8' W PVC Vinyl Fencing. Long-lasting and maintenance-free fencing. Since 1951. 240 Feet of White Vinyl Picket Fencing with Straight Top – Made In the USA! We manufacture premium quality vinyl made from only the highest fencing products and materials, so you can rest easy knowing your fence is safe and secure. Up to 50% stronger than the competition, Weatherables vinyl fencing products are the strongest, most durable option on the market. Louisville (Victorian) Style Scallop Top Spaced Picket. 64 Linear Feet of 4' H x 8' W PVC Vinyl Fencing. Long-lasting and maintenance-free fencing. Since 1951. Denville (Traditional) Style Scalloped Top Spaced Picket. 200 Linear Feet of 4' H x 8' W PVC Vinyl Fencing. Long-lasting and maintenance-free fencing. Since 1951. Louisville (Victorian) Style Scallop Top Spaced Picket. 96 Linear Feet of 4' H x 8' W PVC Vinyl Fencing. Long-lasting and maintenance-free fencing. Since 1951. Louisville (Victorian) Style Straight Top Spaced Picket. 96 Linear Feet of 4' H x 8' W PVC Vinyl Fencing. Long-lasting and maintenance-free fencing. Since 1951. Louisville (Victorian) Style Straight Top Spaced Picket. 200 Linear Feet of 4' H x 8' W PVC Vinyl Fencing. Long-lasting and maintenance-free fencing. Since 1951. Enjoy a privacy fence that is practically care free. The vinyl construction eliminates the need for painting, scraping or staining. Designed to lock pickets into place without the need for glue. Number of pickets for panels. The Glendale fence is easy to assemble and easy to maintain. The durable vinyl never needs to be painted, scraped or stained. Designed to lock pickets into place without the need for glue. Spaced Picket. Louisville (Victorian) Style Scallop Top Spaced Picket. 200 Linear Feet of 4' H x 8' W PVC Vinyl Fencing. Long-lasting and maintenance-free fencing. Since 1951. Fence in your yard and improve curb appeal with the Veranda Glendale 4 ft. x 8 ft. Spaced Picket Vinyl Fence Panel. This fence panel is made with durable, low-maintenance vinyl that never needs to be painted or stained. 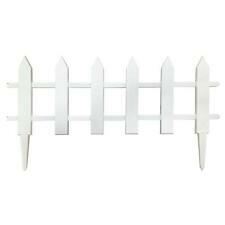 Vinyl Scallop Picket Fence sections look beautiful and will add a touch of class to your property. 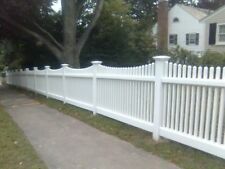 Panels of 8X4 white scallop picket vinyl fence. We also have a special for plain white vinyl privacy pvc fence. Easy to maintain, you will never need to paint, stain or apply harsh chemicals to clean it. Spaced Picket. Neighbor friendly: designed to look equally beautiful on both sides. Fencing Product Type. Aluminum insert in the bottom rail ensures superior strength and durability. Easy to maintain, you will never need to paint, stain or apply harsh chemicals to clean it. Plymouth 5 ft. H x 8 ft. W Tan Vinyl Picket Fence Panel Kit. Spaced Picket. Fencing Product Type. Aluminum insert in the bottom rail ensures superior strength and durability. Give your lawn the elegance it deserves with the Hartford picket fence from Weatherables. The Hartford is a sturdy yet beautiful addition to your yard. Easy to maintain, you will never need to paint, stain or apply harsh chemicals to clean it. The Ellington picket fence from Weatherables provides all of the beauty of a traditional picket fence with the addition of a subtle scallop accent for an elegant touch. The Ellington features wide pickets making it a sturdy yet beautiful addition to your yard. The best part of is this fence is ease of installation. The end result is a sturdy and strong permanent fence that wills last decades. Spaced Picket. nstalls without digging holes or pouring concrete using a patented system.